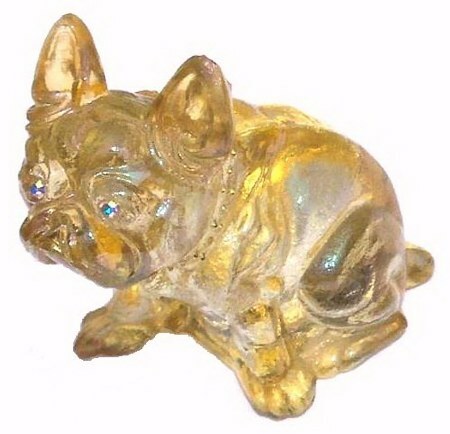 MIKE, this Lucky BULLDOG Paperweight belongs to Dennis Sutton. Our photo of “MIKE, THE BULLDOG” is from the Dennis Sutton collection. Those blue eyes would captivate most anyone! That is one handsome bulldog, right to his fancy collar. We thank Dennis for sending the great photo. 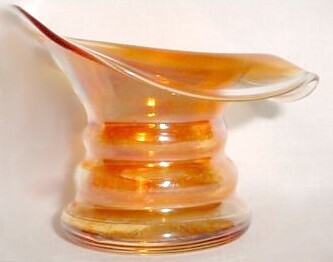 “Mike” was purchased while Dennis attended the 2004 HOACGA Convention in Kansas City. 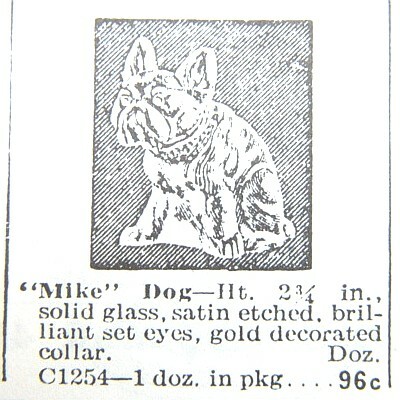 BUTLER BROS. June 1917 ad displaying the Bulldog pinpoints the general time frame when the glass miniature was marketed. TOP HATS can be found occasionally, in a gradual flow of amethyst, pale green and pink, (combined in a single small vase), as well as marigold examples. They are of very thin and delicate glass and can also be ruffled or straight, as well as the jack-in-the-pulpit type shape. These were designed as use for tiny flower arrangements for individual place settings, we have been told. They are about 3 ½”- 4 ½” tall, depending upon the treatment given the top edge, with a base diam. of 2”. In order for you to better understand the impact of these novelties on the collecting public, we decided to list some sale results from the 2004 Lincoln Land Carnival Glass Convention auction performed by Ayers Auction Service. Dutch Boy & Girl Ashtray $15. 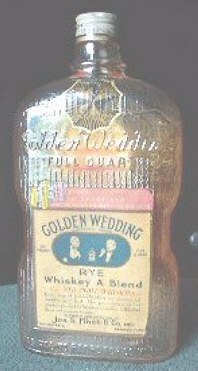 GOLDEN WEDDING issued Dec. 31, 1924 as a promotional. The WHISKEY DECANTERS' purpose is an obvious brewers attempt to promote sales of their particular beverage. These will usually sell in the range of $5. 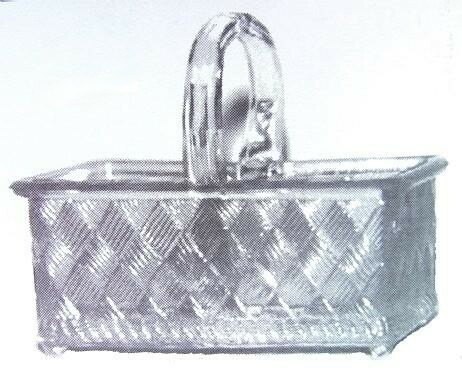 - $35, based upon the size of the container. Continental Distilleries and the more famous and easier to locate, Golden Wedding Whiskey bottles in at least three sizes, are examples in this area. 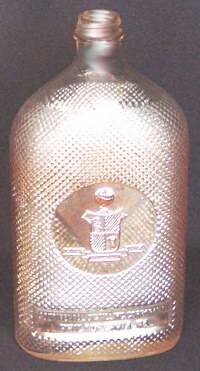 JACKMAN Liquor Bottle: is 8 ½” tall x 4” wide. Bottom of the bottle is stamped with “R88 Patent Pending 10”. 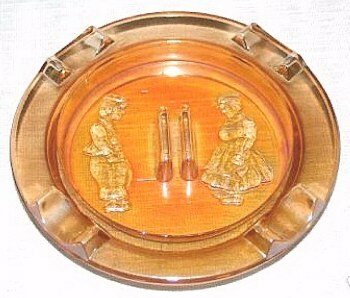 The DUTCH BOY & GIRL Ashtray is 1930s vintage. Size is 5 ¾” in diameter and it is 1” deep. 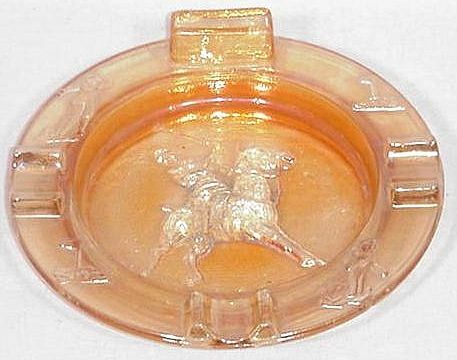 The POLO PLAYER Ashtray is from the same era as the Dutch ashtray and about the same size. 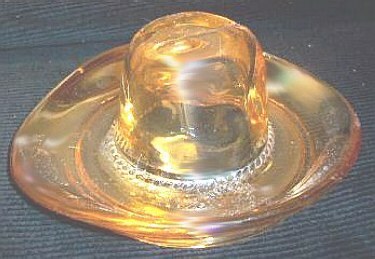 The COWBOY HAT Ashtray has been “dubbed” “LBJ”, but was certainly made prior to the LBJ rein in Texas politics and the White House! Late carnival era, to be sure-probably in the 1920's. 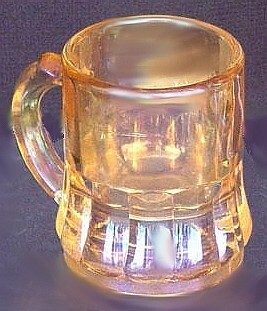 The TINY MUG with a 1” opening is used for a toothpick holder. The only known marigold example of this caster. 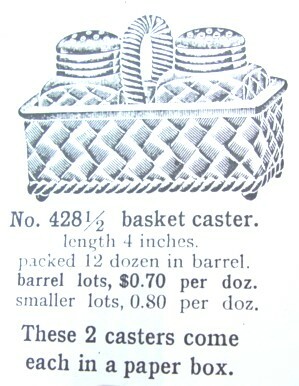 1909 Imperial Glass Catalog ad showing the small caster basket in crystal. Being a Christian means that we know Jesus personally. and we present ourselves to Him. We deny our will and choose His instead. acceptable to God (Romans 12:1-2).